Skiddo in game: 3,557 Who? Important notice! Pokemon Skiddo is a fictional character of humans. Skiddo (Japanese: ??—?? Meecle) is a Grass-type Pokémon introduced in Generation VI. In A Race for Home!, multiple wild Skiddo made their TV debut. The wild Skiddo were used by Trainers for racing. Two of them reappeared during the flashbacks in A Showcase Debut!, Performing with Fiery Charm!, and Till We Compete Again!. Multiple Skiddo appeared in A Fork in the Road! A Parting of the Ways!. Multiple Skiddo appeared in Diancie and the Cocoon of Destruction. A Skiddo appeared in Summer of Discovery! on a video icon. 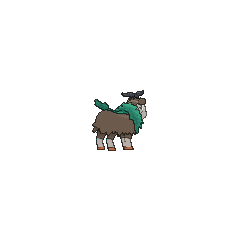 A Trainer's Skiddo also appeared in Thawing an Icy Panic!. A Trainer's Skiddo appeared in a fantasy/flashback in Under the Pledging Tree! and A Showcase Debut!. Two Skiddo appeared during a flashback in The Legend of X, Y, and Z!, each under the ownership of two different Trainers. 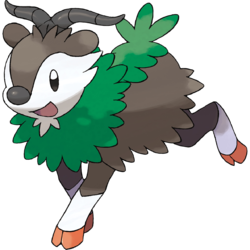 Skiddo is based on a goat kid, possibly a bharal or dwarf bharal due to its horns. It is also based on a bike, as it can be ridden and has riser bar-like horns. 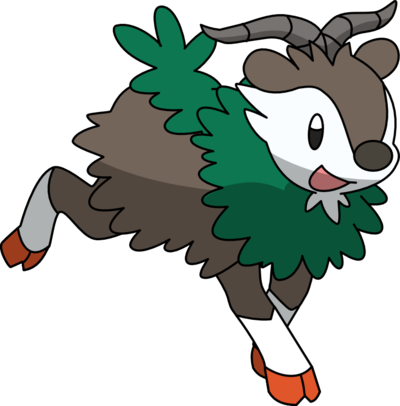 Skiddo may be a combination of skid and kiddo (slang for kid, which is also a term used for young goats.). However, the way it is pronounced in the anime implies it is a corruption of the Ski-Doo snowmobiles. Meecle may be a combination of ?— me (the sound of a goat bleating) and vehicle or bicycle.